A slice of heaven tucked away amidst lush greens of Coonoor is what awaits you at Strathearn B&B. Plus, it’s old-world English style architecture and its lush gardens make it a perfect weekend getaway. 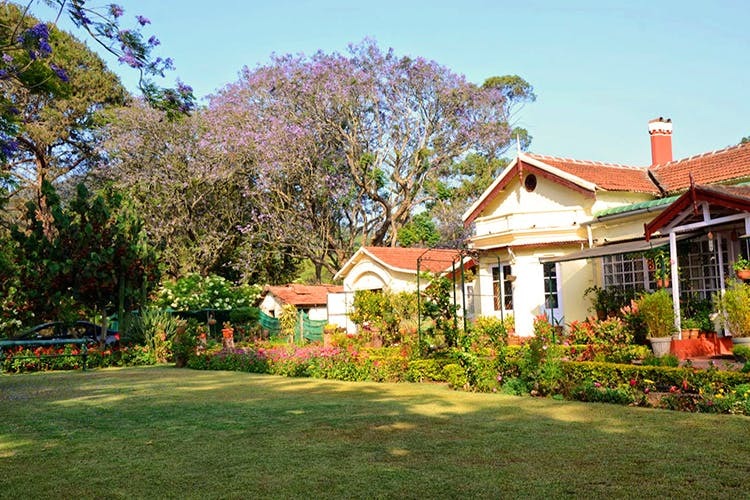 Strathearn B&B is a quintessential old-school Ooty homestay — old-world charm, very English architecture, and plenty of garden space. Whether you’re spending the weekend here or on a short trip, you’ll enjoy the quiet and serene ambience that the privacy and remoteness of this homestay offers. The property is set against the backdrop of hills, so sunsets are going to be extra special here. Oh, and did we mention about the large sprawling garden filled with colourful blooms that overlooks Sim’s Park? Well, the garden is the perfect spot for you to have a picnic, just laze around or huddle up late evening around the bonfire. There’s a majestic jacaranda tree that blooms purple flower on one side of the homestay, giving the whole place a purple tint. The homestay comes with two fairly large bedrooms with all the required amenities along with a lounge that leads to the garden. On request, they can also arrange bon fires, barbeques, and more. Apart from this, the homestay offers you complimentary South Indian breakfast such as idlis, vadas, appams, and poori bhaji. You also have WiFi access as well. The homestay offers easy access to Coonoor’s and Ooty’s tourist spots such as Lamb’s Rock and Dolphin’s Nose with Sim’s Park a hop, skip, and a jump from the property. You can also drive down to Wellington, Kotagiri, and Ooty township as all of these places are within the 20 kilometer radius.